I’ve written before about how I develop ( oftentimes extreme) author crushes. Chabon and Maguire are two of the my biggest. They make me want to a be better writer (which is to say a good writer), they make me feel ashamed that I have never created the kind of sentences they do, seemingly effortlessly. I often stop and reread, particularly in Chabon’s case, a phrase that is a brain teaser, something you have to really sit and ponder before you really get it. Suffice to say, I love these guys. I adore them. If I were a worshipful person, I might even deify them. Which is why these two books were such a fist-in-the-gut disappointment. 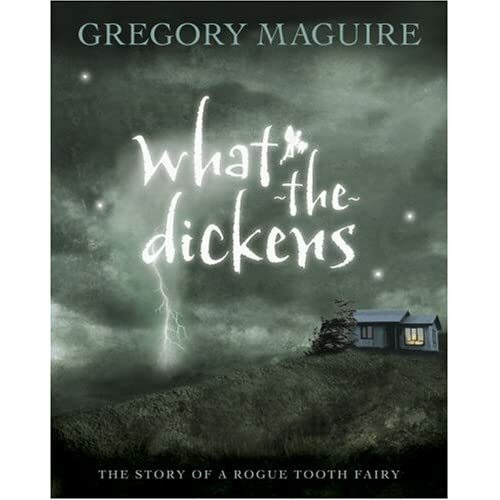 I’ve seen Gregory Maguire speak recently and he explained the origin of What The Dickens as a way to process some harsh feelings he was having about political issues. OK, I applaud that. I respect that. But really, that’s what journals are for. Let me explain. I don’t mind, in fact I often enjoy, obvious metaphors in books. I also admire authors who express their political beliefs through stories. Wicked for example is a highly politicised book and it’s well defined, comprehensive, impressive and wonderful. In other words, everything What The Dickens is not. This book, geared toward a youthful audience is a strange soup of ideas, none of which seem to have a clear link. And where it is clear, it’s as blunt (and as pleasurable) as a baseball bat to the head. I cannot imagine children enjoying this book; they would just be confused at all the nonsensical rambling. And I’m not afraid to admit as an adult, I was more than a bit confused too. It truly was hard to keep picking it up – it took me weeks to finish. If Maguire was hard to keep interested in, Chabon’s book was hard to get interested in. At least at first. For one, the Gentiles among us will need a Yiddish-English dictionary just to stop from being confused (by the way Chabon used one when writing this book check it out here). My Yiddish vocabulary consists of three words, Oy! Schmuck and Mench, none of which are very helpful in this case. I kept getting the sholem (a gun or is it blessing or is that an inside joke I just don’t get?????) mixed up with a Shoyfer (an imaginary brand of cell phone, which incidentally means a “ram’s horn” in Yiddish), which as you can see is awfully disconcerting, particularly when Landsman, his volatile protagonist, is angrily reaching into his coat pocket for one (or the other). It took me many dozens of pages to either figure the words out by context or to ignore them completely. I’m sure his names are amusing to the Jewish among us, but they are just Yiddish to me. Sentences like these can wound the heart.